Former Alaska Gov. Sarah Palin began a tightly stage-managed visit to Haiti on Saturday in which she visited cholera clinics while avoiding crowds and the press. The 2008 vice presidential candidate was a guest of Rev. Franklin Graham, whose aid group works in the impoverished country. Haiti is facing a brutal cholera epidemic while struggling with an electoral crisis and reconstruction from the January earthquake. Palin, who traveled in part by helicopter, provided access on her tour solely to the U.S. cable network Fox News. Graham's organization, Samaritan's Purse, refused to discuss Palin's itinerary with other media and asked Haitian and American reporters to leave its compounds, citing a "security lockdown." "I've really enjoyed meeting this community. They are so full of joy," Palin was quoted as saying on the organization's website. "We are so fortunate in America, and we are responsible for helping those less fortunate." Associated Press television journalists saw Palin talking with foreign aid workers. She wore cargo pants, a T-shirt and designer sunglasses on her first trip outside the United States since speaking to investors in Hong Kong last year. That speech was also closed to the media. It is interesting that Graham's compound was under "security lockdown" and all Haitian and American reporters were asked to leave except Fox News, which covered Palin exclusively. Palin's quote is also interesting being that she seemed to avoid any real crowds opting for the photo-ops with children and relief workers. 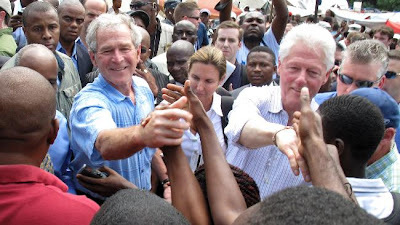 At least she didn't wipe her hand on Bill Clinton after shaking hands with some Haitians, but then in order to do so Palin would have had to actually meet some Haitians. I wonder if Fox news posted a casting call for sick Haitians for Palin to visit. Is it any surprise Haitians weren't familiar with the former half-term governor of Alaska?